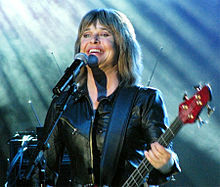 Suzi Quatro (June 3, 1950) is an American rock musician, said by some people to be the "Godmother of Rock". She has sold more than 50 million records. She usually wore black leather clothes. Quatro was born in Detroit, Michigan. She started playing bass guitar and formed a girl band, Pleasure Seekers, with her sisters when she was only 14 years old. She went to Britain in 1971 with record producer Mickie Most, who also worked with The Animals, Lulu, and Donovan. Her first hit single was "Can the Can" which went to number one on the sales charts in Europe and Australia. Other big hits were "Devil Gate Drive" (1974), "If You Can't Give Me Love" (1978) and "Stumblin' In" (1978). She married guitar player, Len Tuckey, in 1976 but divorced him in 1992. She is now married to a German concert promoter, Rainer Haas. She has also acted on TV with guest roles in Happy Days, Minder, Absolutely Fabulous, and Midsomer Murders. She was the voice of Rio in the 2006 Bob the Builder movie, Built To Be Wild. She also had a weekly radio show on BBC2, called "Wake Up Little Suzi". This page was last changed on 18 May 2013, at 06:11.